The Rusty Bar Ranch in Roy, Washington, will host an Endurance 101 Clinic on March 1-3, 2019. 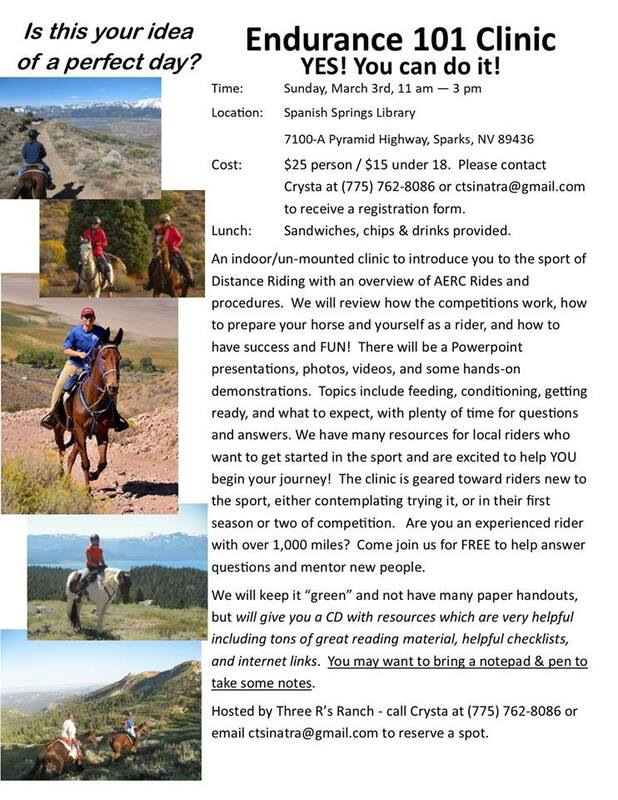 Are you curious about what endurance riding is all about or nervous about taking that first step? Have you been to an event but still want to learn more? Guest speakers are Celena Pentrack Dr Mike Witt, DVM; Ann Szolas; and Alex Lewis. Topics include equine foot anatomy, nutrition/conditioning, learning to pulse, proper trot outs, saddle fit, massage techniques you can take home, and "SHEENA" the total riding simulator. Cost is $100 per person/horse for all weekend, $20 per night for stalls, $75 for the Mock Ride (Sunday only), or $35 audit per day. We invite horse back riders, wagons, carts, bikers, hikers, and walkers to come along and join us on the “Ride of a Lifetime” every spring for our annual “Cross State Ride”! Do you think you are tough enough?